We have a number of customers who use Podio as their CRM system. Using our software, they can visualize and stream their Podio data via Plecto dashboards that display around the office. That way, they keep their teams informed and motivated using our custom recognition features—leaderboards, notifications and achievements, for example. Pairing the systems makes great sense for sales-oriented companies looking to boil down their CRM data or leverage competition to increase team productivity. Yet, the systems can also be integrated and used to improve project management. In fact, our development team does just that. 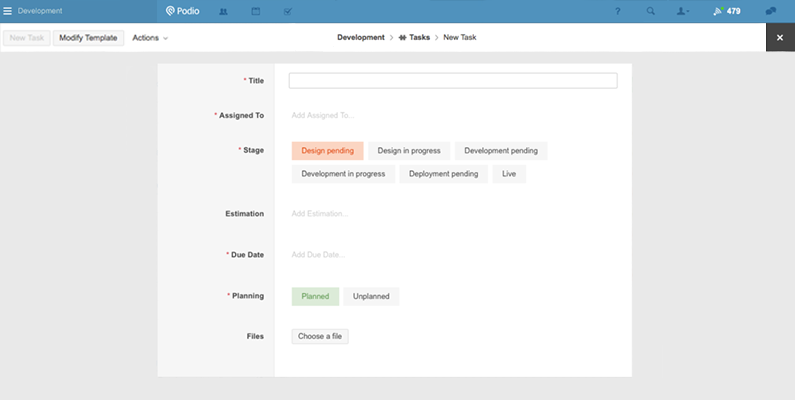 We use Podio to track and manage tasks, and we use Plecto to visualize and monitor progress. Every Monday morning, our development team meets to review customer feedback and prioritize tasks for the week. 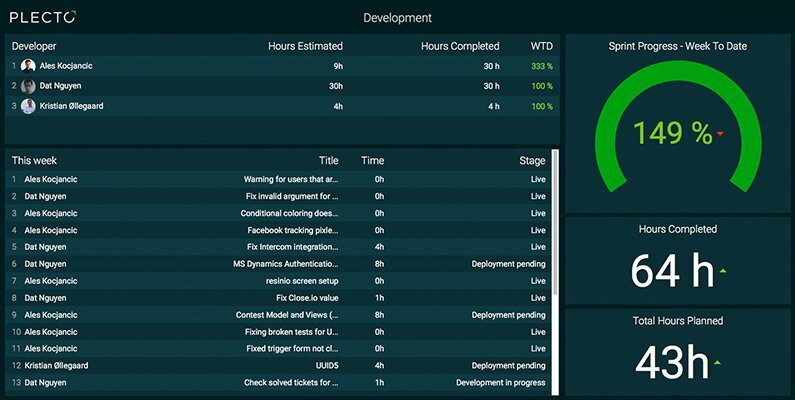 All of these discussed tasks are captured in Podio and categorized as “Planned.” For every task assigned to them, the respective developer estimates the completion time in hours. Of course, ad hoc tasks pop up throughout the week. These are also assigned to a developer and captured in Podio, but these are categorized as “Unplanned.” The team is then held accountable for the total number of hours they’ve committed to do. The hours meant to be spent on planned tasks are substituted with any unplanned tasks that come up. Any incomplete planned tasks are held in Podio for the following week. Ultimately, the team is only held accountable for the number of hours planned. Attached is a screenshot of the Development dashboard. We track the total “Hours Estimated,” the number of “Hours Completed” and what percentage of all tasks allotted for the week are done. Moreover, all of the tasks for the current week are listed in a table. That way, everyone in the office can see the “Stage” of each task and how much time it will take to finish. And, when a customer calls looking for a quick update, no one on the development team gets tapped on the shoulder. Best yet, because the full team can watch what’s being done, the development team keeps Podio updated with accurate information. This set-up improves visibility, accountability and even productivity.